This dropped at some point on Agnarr progression server, unless Marcia is active there (I wouldn't expect so, but I don't know). Verification is that I bought it and it is in my inventory as of today. If it is dropping on progression, what NPC (likely in Old Sebilis based on ancient history?). Is it dropping for a limited time as per some other progression drops? Well I just bought one tonight and According to info i got talking to the toon, he got it in SEB like 2 weeks ago. So it is still dropping OR has started dropping again. And there are 2 items closely named. Obviously the statless one is vendor trash. I am selling this right now to vendor, says the name but no longer has the stats, dropped in POJ last night. #ifesfor, Posted: Jul 10 2003 at 12:23 AM, Rating: Sub-Default, (Expand Post) I have this for sale, on Xev server for 25k. No longer drops,got mine and am torn between selling and keeping,nostalgia and all that. this ring is VERY uber in my book, ima 55 shammy, Affliction Efficiency III gives sososo much more mana.... im always casting affliction based spells and being able to save mana on every spell means i can solo alot more wit my mana... if someone would tell me what drops this ring or how i could get it, thatd be wonderfull! #ShammyKonar, Posted: Nov 11 2002 at 6:26 AM, Rating: Sub-Default, (Expand Post) Looking to buy this item on the Tunare server. Please send tells to my shaman Konar and we can negotiate a price. First, to those posting about Extented Affliction (+20% duration) or Affliction HASTE (reduced cast time), please get your terms straight. Affliction EFFICIENCY (the affect of THIS item listed above), reduces casting COST (mana cost) by 25%. Second, it may be a recent change, but now ANY offensive spell with a duration (including Root and Snare) are once again affected by the "Affliction" line of focus items. I know this because my druid uses these focus items to great effect. They even affect debuffs such as Ro's Fiery Sundering and Fixation of Ro. Since neither of these 2 spells deal any damage to the target, I know the earlier statements made in this thread are false. Again, Verant may have "un-nerfed" it to re-include these types fo spells. "Second, it may be a recent change, but now ANY offensive spell with a duration (including Root and Snare) are once again affected by the "Affliction" line of focus items." This has recently been fixed once again to not work on non-DoT spells, but I wouldn't be the least bit surprised if it broke again in the future. I am quite enjoying this ring on my ogre shadowknight. Dooming Darkness for cheap? Yes please. It doesn't affect spells that don't do damage. So no change for snare. But it's great for darkness. And the 10 ac +7 str isn't bad either. #Hilbur, Posted: Jun 09 2002 at 3:59 AM, Rating: Sub-Default, (Expand Post) You said what pure caster wants this? What makes you think only pure casters cast affliction spells? Me. I would love it to see my ranger getting off snare faster on that mob that is trying to get away. That means you cast spells in 2/3 of the time of before, only on spells that have a duration of 6 ticks (buffs/dots/snare, etc), on spells that take 3+ seconds to cast (snare is 2.5), detrimental (snare counts), and HP modifying spells (necro/sk snare would apply, but not ranger spells). Sorry Hilbur, but rangers wouldn't be able to make much use of the effect. Which isn't to say it's not still a good ranger item as 10 ac and 7str on your finger is pretty nice. Ok, A few things I need to cover so you all Know. I have the Circlet of Falinkan, Affliction Haste 3. This effect DOES effect spell such as Tugur's Insects, and other NON-hp spells. My slows, debuffs, and others cast in 2/3 the time. I can hope, and pray, that when I finally get one of these rings it will also have the same effect and save me mana on my slos, and dots, and such. #Psychogears, Posted: Jul 12 2002 at 1:32 PM, Rating: Sub-Default, (Expand Post) Affliction Haste works on spells that last 6 or more ticks, not just 6 ticks, according to that info. Lets not forget all those shadowknights out there with dooming darkness. This would certainly make fear-kiting much less stressful. PS I stand corrected they changed the Shissar to Enhancement Haste III now. Guess all brain cells aren't dead yet..
You're a bit off here. There is no effect that gives 33% spell haste to all damage spells. There's affliction haste, which gives 33% haste to any harmful *duration* spell with casting time of at least 3 seconds. Duration spells include DoTs, roots, snares, and fear. The effect "Spell Haste" applies to ALL spells (though it won't stack with any of the school-specific haste effects, like affliction haste and enhancement haste, nor will it work with Complete Heal), and the haste on that is only 15%. That being said, the effect on this piece isn't Haste at all. Affliction Efficiency saves you 25% mana on all harmful duration spells with a duration of at least 36 seconds. Again, this applies to DoTs, roots, snares, fear, etc. couldn't wait to flame, could ya? and then, after they'd corrected the mistake (and very quickly), you still have to flame in your retraction. This item no longer drops in game. Back in the day, when Kunark first came out, loot tables were initially very screwed up. Gem encrested rings were actually on the same loot table as forest loops, and dropped off of mountain giants in Frontier Mountains (where I got mine the first week of Kunark's existence). A couple weeks after the release of the game, the loot tables were fixed, and the gem encrested ring dropped no more. 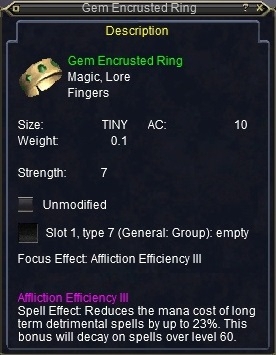 (It's rumored to now drop in Veeshan's Peak, but this has not been confirmed, and it certainly doesn't drop in Sebilis) The gem encrested ring was perhaps the worst of the loot table mixups, because it was, and still is, considered "god loot", simply because it has an awesome amount of AC for a ring, and a generous amount of STR. Definitely better than anything that should have been dropping off of level 30 mobs. On Tunare, they sell for around 20k (on the rare occasion someone decides to part with one for plat), but with its extreme scarcity, the market is almost non-existent for this item. I'm certainly never selling mine. If it doesn't drop....why did they put an effect on it? All effects on items were retroactive - if you already had one, the effect was pasted onto your item. Whoever has this ring now also has the effect, even if no new ones are dropping (a subject I'll just stay out of). Nice items get interesting effects... even if by higher levels you have no use for the effect ('cuz you have no use for casting lower than lvl 20, or 40-something spells ever at all within that category). This ring is worth far more than 3k. If as the information on this site points too it is no longer dropped (save in GM events) then it is very rare. For your average melee class out there this ring is INVALUABLE. Very few rings have this much or better AC. For classes like warriors at higher lvls the only thing that matters is AC, and to a lesser extent pure HP. I buy and sell quite a bit on my server (Torv) and this ring would go for bare minimum 10-15k. Probably higher, much higher. OK first off yeah its a sweet ring. its so expensive because it is the HIGHEST ac droppable ring available to tanks PERIOD. OMG at 55 i would love to upgrade both my 6ac 65hps rings to these, with skill bonuses my ac would go up about 15 points from my current 1090 unbuffed. #Amazingwiz, Posted: Feb 26 2002 at 12:36 PM, Rating: Sub-Default, (Expand Post) You guys that say this item dont drop anymore are crazy!.. Where you get your information from? Only given at gm events? haha funney. hay when you make a post don't try and discourage ppls. you dont even say where or how you get your info you just say "they dont drop anymore" Doh! ya right. This ring has been confirmed to no longer drop. In fact, it hasn't dropped for well over a year. So it is YOU who is making the false statement sir, and that is hardly the kind of thing that needs to be on this board. Go back to LOIO and chase sarnaks, because it's obvious you have no clue what you are talking about. Depending on your class, I�d say: Keep it. Selling it is tempting because of all the goodies you could buy for the money. But the person who gave it to you, wanted YOU to have it. Honor his wish and generousity and keep it. Just for the sake of being.... honorable, or something like that. This - of course- only applies if it�s good for your class. Otherwise just sell it. It's been given away in few different GM quests even though it no longer "drops" in the game... too bad it's a nice ring. It dropped this past weekend at another GM event. Was an event for lower lvls so anyone had a chance. this drops off REETs in sebilis I heard. but I don't know anyone that has got one sense they stoped droping off those lvl 30-35 giants all over Kunrak.